We’re hunkered down here in full winter huddling mode. Even the dog streaks back inside the second he finishes his business. I think he’s pondering how to use our nice, warm toilet. For the love of God, Tony, shutter your restaurant and move our miserable family to Tahiti. OK, I’ll calm down now. With enough sweatshirts, hot tea and comfort foods I think I can make it through to April. I have been making chili, soups, roasts and broths for me and the occasional Japanese comfort food for Tony. 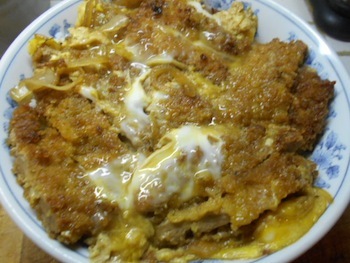 One of his favorites, maybe even more than the Japanese curry I made a couple of weeks ago, is Katsudon. He’s crazy about it and last week, when I removed the lid from the steaming one-pot meal, I caught the bug, too. It smells heavenly and looks like an impressionist painting. Katsudon is a pork cutlet fried until crisp and served in a soothing, rich broth. At the last minute, a beaten egg is cracked into the pan atop the pork and vegetables and steamed until just set. Everything is ladled into a big bowl over rice. To me the dark, slightly sweet broth is the star and it couldn’t be simpler to make. Dashi – a Japanese seafood both made from bonito flakes – is combined with white wine, sugar and soy sauce and simmered in a saucepan. This recipe is for one portion. Double, triple or quadruple it to serve more people. It will give you hope and warmth while awaiting spring. Trim pork of all fat. With a meat pounder, flatten chop to about 1/4-inch thick. Dredge in flour and shake off excess. Dip in egg, then coat with panko. Heat about 1/2-inch of oil in a medium skillet. When hot, fry chop in oil, turning to brown both sides. Drain on paper towels and set aside. In a medium saucepan, combine water, dashi granules, mirin, soy sauce, sugar and salt. Bring to a boil and simmer for five minutes to combine flavors. Cut fried pork cutlet into 5 or 6 strips. Gently transfer with a spatula to the simmering broth. Beat egg briefly and pour over meat. Cover pan and gently simmer 1 minute or until egg is set. Serve over rice in a large bowl. Makes 1 serving. Call the Midwife, Last Tango in Halifax, The Graham Norton Show, Midsomer Mysteries, Hinterland, The Fall, Jack Taylor, Vera, Monarch of the Glen, Foyle’s War, Duchess of Duke Street and The House of Elliot. Unfortunately, I can’t use any of those suggestions. I haven’t seen my remote control in two weeks. Yes, I looked in the dog’s bed. And in the silverware drawer, my cosmetics bag, the magazine rack and the refrigerator, among other places. Arrrgh! Regarding water in margarine — also, I don’t buy “cheap” butter as I found it has more water in it. Best to stick with better name brands when making the effort to cook something you want to turn out good. Dear Dorothy: Exactly. Although I use whichever butter is on sale, you’re correct about the varying qualities of real butter. If I had money to burn I’d use a cultured European-style butter such as that made by the Vermont Butter & Cheese Co.
Plugra was the first European-style butter to be sold here. They have a higher proportion of fat than regular butter, and many cooks believe they make pastries flakier, make cakes rise higher, and give sauces and baked goods a richer flavor. Culturing (ripening the cream) produces an even richer flavor, although not all luxury butters are cultured. In a taste test I conducted for the Beacon Journal in 2004, however, only 7 out of 21 tasters could tell the difference between cookies made with Plugra and cookies made with regular butter. The Plugra cookies did rise remarkably higher than the other cookies, though. I had to use smaller scoops of dough to make them the same size as the non-Plugra cookies. Flavor and performance aside, these luxury butters cost considerably more than regular butter. That may be why they have captured just a small sliver of the U.S. butter market. Love your emails and have made your recipes quite often with good results. Question: Have you got a good recipe for Japanese udon noodle soup? Thanks for your time. Dear Denise: I rarely cook with udon noodles – thick, white Japanese wheat noodles — because I’m not crazy about the texture. I haven’t tried the following recipe but it is from a trusted source. In “Japanese Cooking for the American Table,” author Karen Green shares a recipe for Nabeyaki Udon, a dashi-based udon noodle soup with an array of toppings. Her version features chicken, shrimp, green onion, spinach leaves and a barely cooked egg. She also adds kamaboko, which are fish-paste cakes dyed a variety of violent colors. The cakes are popular in Japan, but I have never warmed to them. If you want, leave them out. Buy frozen (not dried) udon noodles, dashi powder, nori (crisp sheets of dried seaweed) and shichimi (7-pepper spice) at an Asian store. Bring a large pot of water to a boil. Add the frozen udon. When noodles have thawed and water returns to a boil, separate noodles with chopsticks. Remove from heat, cover and let stand for 10 minutes. Noodles should be cooked but not soft. Rinse in cold water and drain in a sieve. Noodles should be completely dry before they are added to the soup. Place a medium saucepan on the stove and chicken and shrimp to the side. Remove mushrooms from the water and slice. Have remaining ingredients handy. Place the dashi (see note) in the saucepan and heat. Add sake, sugar and soy just before dashi comes to a boil. Refresh udon by dipping, still in sieve, in boiling water. Shake, drain completely and add to soup. Top noodles with chicken, shrimp, shiitake, kamaboko (if using) and green onion. Cover and cook over high heat until soup comes to a boil. Uncover and add spinach. Carefully crack the egg on top of the green onion. Cover and turn off heat. Let stand a few minutes for the egg to poach slightly. Uncover and carefully transfer to a bowl. Garnish with the nori strip and hot pepper. Makes 1 serving. Note: To make dashi, bring 1 1/2 cups water to a simmer in a saucepan. Add 3/4 teaspoon instant dashi powder and stir to dissolve. Remove from heat. May be made in advance and refrigerated. Could I have the pot roast recipe mentioned in last week’s newsletter? I must have missed that one. Dear Trudy: My blog site on wordpress is now up to date with back issues and a searchable database thanks to my editor at Mimi Vanderhaven (my publisher), Morgan Lasher. The link to the Dec. 31 newsletter, which contains the recipe for Pennsylvania Pot Roast, is https://janesnowtoday.wordpress.com/2014/12/31/december-31-2014/ . Note that this is not my signup website, which remains www.janesnowtoday.com .